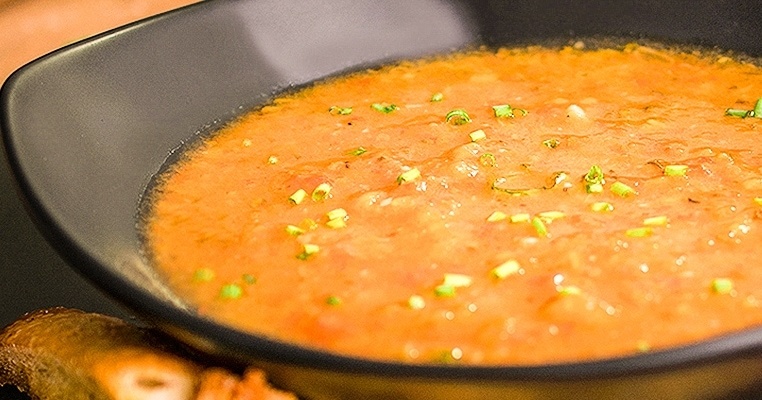 Whether you enjoy this soup as the first course of a delicious Italian meal or with grilled cheese for a comforting lunch, it’s sure to be a delight. Roasted red pepper and tomato soup is creamy yet healthy and vegan, and like most soups, it’s pretty easy to make. The secret to the intense flavor of this dish is roasting the fresh tomatoes and bell peppers yourself, but if you find yourself short on time, you can substitute canned versions. To complete this meal, slice up some fresh ciabatta bread or focaccia, grill it, and serve it alongside the bowl for dipping while you enjoy the soup. I love when winter comes and I can make these delicious, healthy soups that warm the house and the heart … and they are so easy to prepare for just a few people or for even a crowd. Roasted red peppers are an Italian staple that is so flavorful and makes this vibrant soup nutritious and comforting. Preheat the oven to 425 F. Toss together the tomatoes, red peppers, olive oil, salt, and pepper. Spread in one layer on a baking sheet and roast for 30 minutes. Remove from the oven and peel the skins from the peppers and tomatoes. In a large stockpot over medium heat, sauté the garlic in 3 tablespoons of olive oil for 3 minutes. Add the roasted tomatoes, roasted red peppers, basil, red pepper flakes, and vegetable stock. Bring to a boil and simmer for 30 minutes. With an emersion blender, blend the soup to a creamy consistency. Check for seasoning. Serve hot with a drizzle of extra-virgin olive oil on top and a slice of grilled Italian ciabatta bread on the side.